A Boat (beneath a sunny sky), 2016-17, oil on canvas, 120 x 153cm. 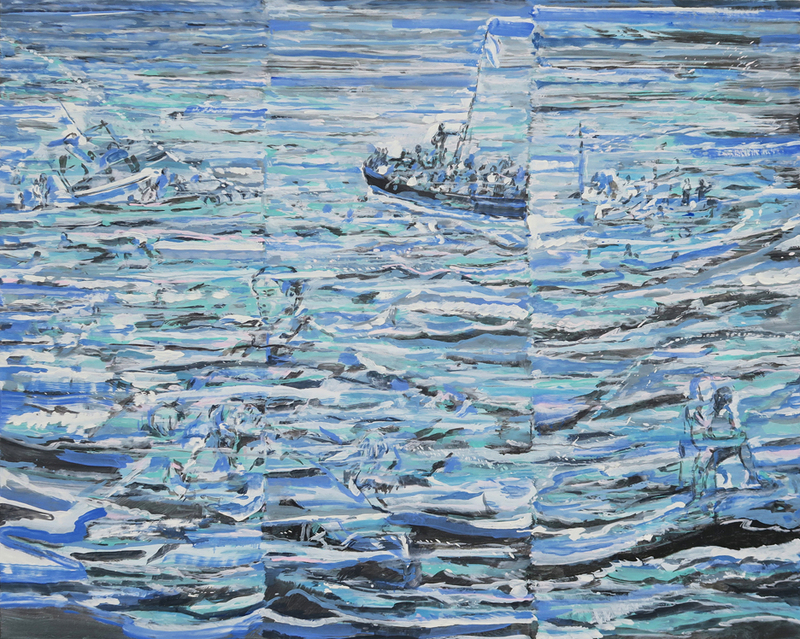 Sea Border (Warszawa, Praga), 2018, oil on canvas, 110 x 200cm . The vertical/horizontal blue line is a physical boundary within the painting, yet it is also a metaphorical break between land and sea. In western cultures, the beach has come to represent recreation and relaxation, ease of mind and, at the economic level, a good quality of life. At the same time, the beach also functions as a non-place, a heterotopia, in which interpersonal relations play out in an entirely different way than in the typical hegemonic sphere. 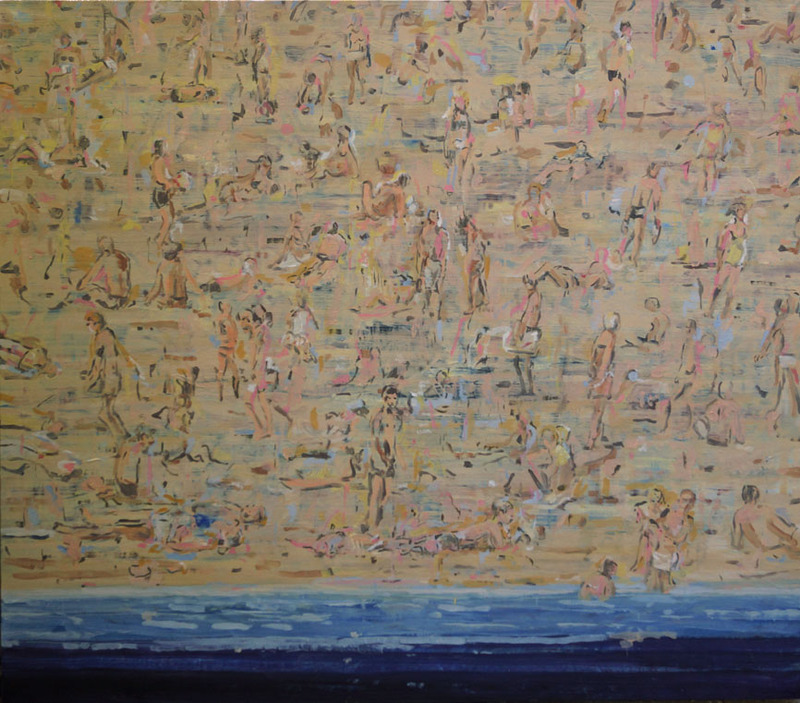 I worked on this painting for more than a year, adding layer upon layer of paint, making an effort to render this multiplicity of meanings that the beach holds for us today. See Border (Budapest), 2017, oil canvas, 90 x 190 cm. I typically spend two months a year in Portugal, where coastal culture is particularly vibrant. The geopolitical events of the past few years have stripped the beach of its serenity. The migrant crisis and waves of refugees making their way across the Mediterranean on makeshift boats has taken its tragic toll. Our collective memory now holds the image of a three-year-old boy named Aylan, found drowned along the European coast. The news called him a symbol of ‘humanity washed ashore’. This year, as I lay back on the warm sand, I can’t help but feel a sense of guilt and I can no longer experience the beach as a space that functions outside the geo-political sphere. 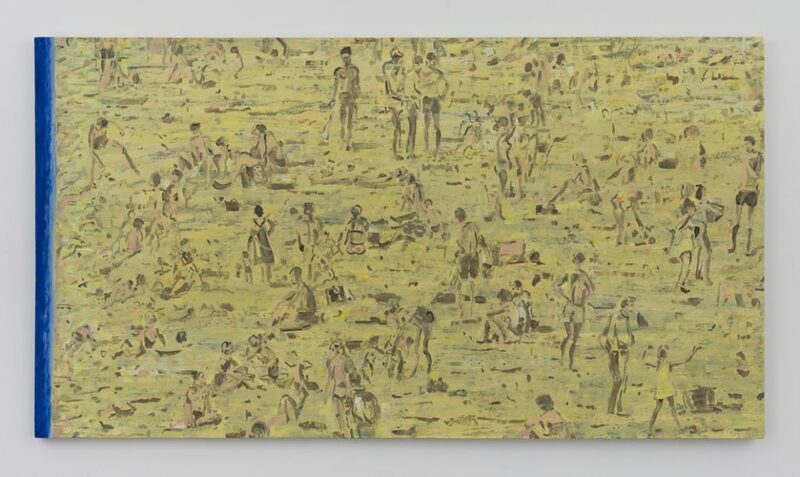 In its formal aspect, the figures of the beachgoers are reminiscent of the pattern of a traditional Persian rug that adorns the floor of my living room in Warsaw. I painted them using a single hue on a monochrome yellow background. They look like a decoration on fabric or a modernist all-over composition. See Border (Wien), 2017, oil canvas, 160 x 180 cm.